May also include a monogrammed ribbon and a matching handmade flower! This sale is for the WHITE HAT. Other colors are listed in my Etsy Shop! There are 2 separate options for this hat! 2. Ribbon w/ Monogram on Bow AND flower. Bows & flowers shown are samples only. You may choose pink, black or white ribbon and bow. Other colors are available by special order and take a little longer to ship. 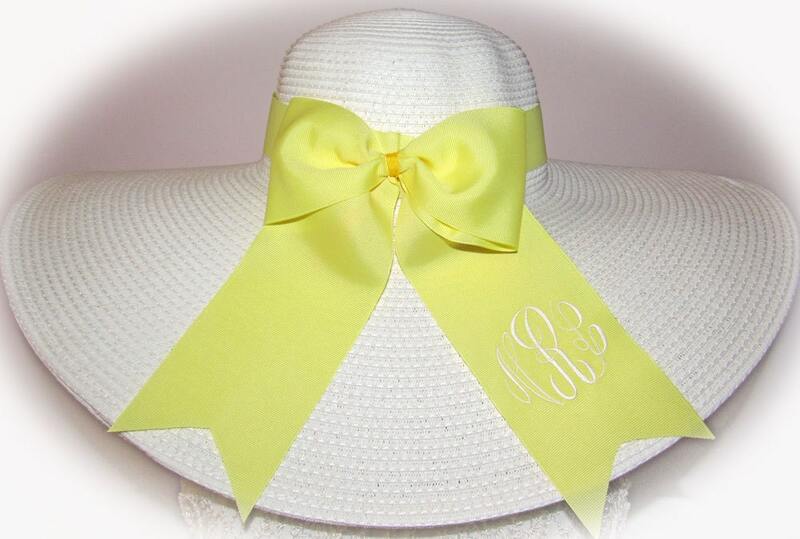 All monograms are embroidered on a 3 inch heavy grosgrain ribbon. Commercial grade. Your monogram will be approximately 2.5 inches wide by 2+ inches high depending on your choice of font. Flower stock is seasonal but you may request your colors also. Lovely Wide Brimmed Floppy Sun Bonnet - White and so Gorgeous & Elegant! The band and bow are detachable! You may also wear the bow in any position you choose-front, back or side! This sale is for the WHITE only Hat. We also have PINK, coral, natural w/black, black, navy, or red hats and are listed in our Etsy Store. If you want a different color than the white, just send a convo or email and I will set up a private sale link just for you! Monogrammed with 3 letter monogram with low density on ribbon sash. The monogram shown in picture is called INTERLOCK and stitches out very well on ribbons. Heavier thick monograms will not stitch well. Please send convo for your choice! 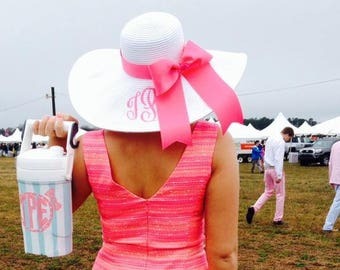 Please be sure to pick a 3 letter monogram that shows caps and not a name monogram that has lower case letters. Shipping by Priority mail only with confirmation :) We ship to Paypal verified addresses only unless other arrangements are approved prior to shipping and purchase.